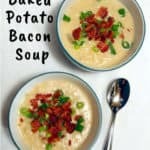 I’ve been thinking about this delicious baked potato and bacon soup for a while, and I finally revisited it. I’m glad I did. 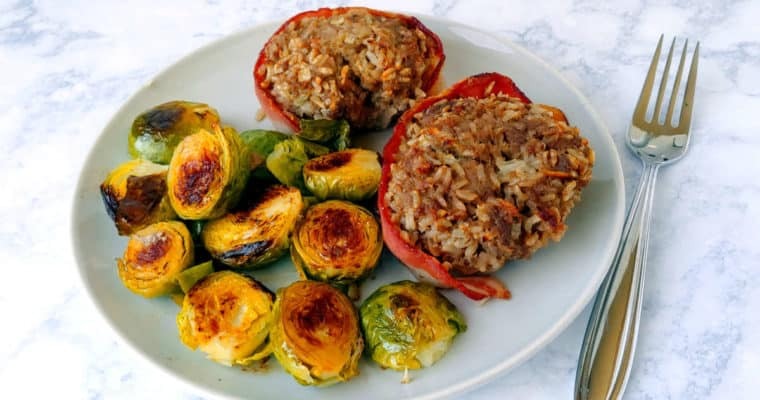 It’s easy to make, while being hearty, filling, and delicious. In other words, incredibly satisfying. And it’s perfect for winter. It also happens to be very inexpensive to make. 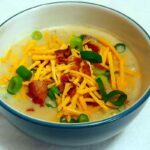 When I first made this soup, I was doing rather well with budgeting and stretching our grocery money while I hunted for a job. Bacon can be expensive, but if you’re lucky you find it on sale. Potatoes are cheap. It takes broth (although I use bouillon, which is less expensive) and milk, instead of cream. I also didn’t want any kind of recipe that had flour added to it to thicken it up. It just seemed unnecessary. Cream was out, because it was expensive – and I also didn’t want to add too many calories. Winter has finally arrived in St. Louis. Yesterday we reached a balmy high of 56F, and Alex and I took our dog for a leisurely walk. Today, we’ve had a few inches of snow, and when I walked my dog, it was 17F and felt like -1. Luckily, we usually don’t get those kind of temperature swings here in South Jersey. But this soup is great, whether or not your weather is below freezing. 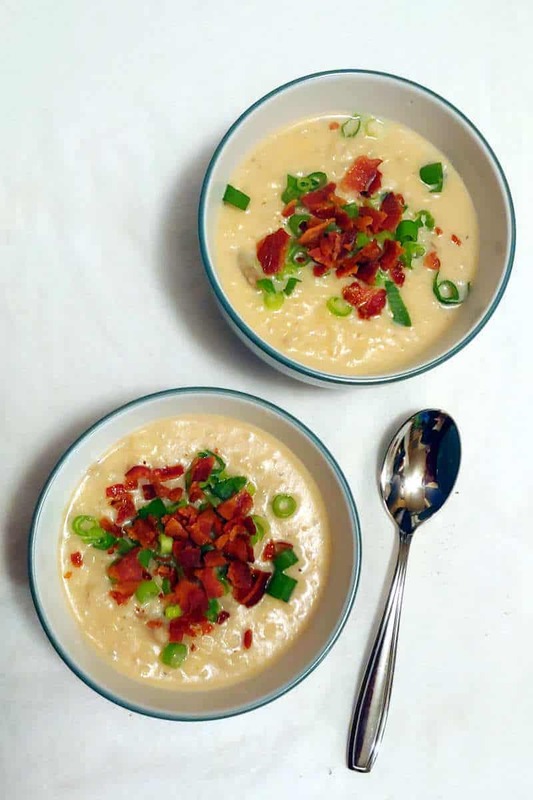 I adapted this recipe from the Baked Potato and Bacon Soup recipe from Cooking Light. That recipe made a ton! So I cut it in half for this (and cut way back on the onion – their recipes tend to go overboard on it). 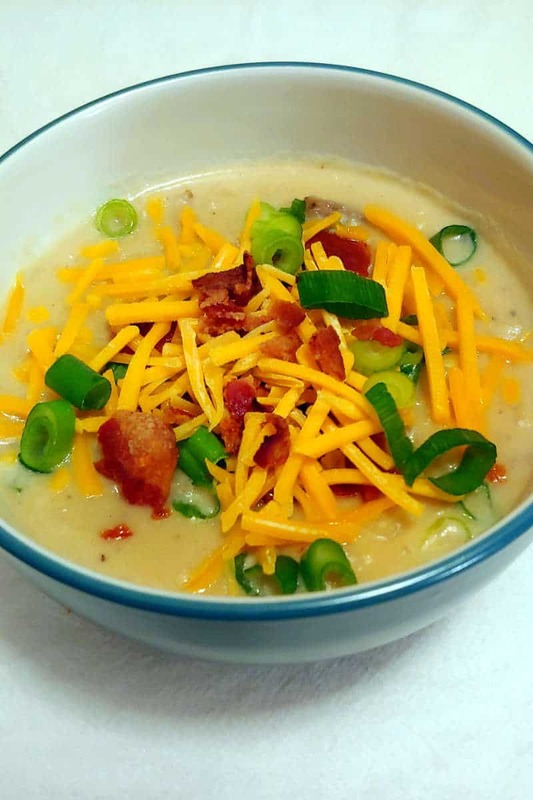 This baked potato soup is easy to make, but it does take a little time. In fact, half of the time is just baking potatoes! This process can be sped up if you bake your potatoes ahead of time – say, over the weekend or when you’re making dinner a previous day. You can also microwave your potatoes instead. 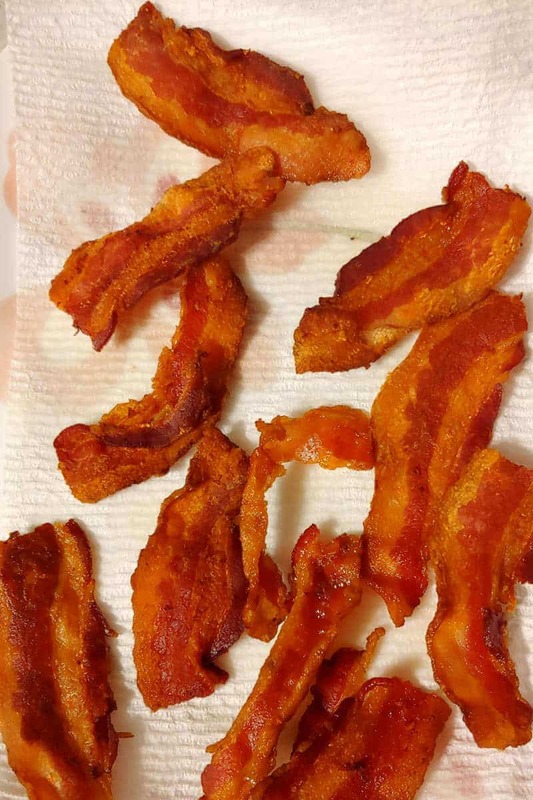 Once your bacon is done, saute the chopped onion for 5 minutes. Add the garlic and bay leaf, and cook for a few minutes more. While your bacon and onion cooks, cut your potatoes in half and slice them. No need to cut them too small, because you will mash them later. I prefer keeping skins on for texture, but remove them if it will bother you. Once your onion and garlic have cooked, toss in the potatoes, milk, broth, salt, and pepper. You will want to use less salt and add to taste if you use regular broth; I always try to use lower sodium broth. Remove the pot from heat and use a potato masher to mash up the potatoes. I bet you can use an immersion blender if you want it to be very smooth. However, I prefer mine chunky. Taste the soup and add salt or pepper if necessary, and add extra milk if you’d like it thinner. What Kind of Potatoes Should I Use to Make Soup? If you’re buying potatoes, seek out some starchy baking or all-purpose potatoes. I used Russets, and I think Yukon Gold potatoes would also work well here. In general, you want a potato that will fall apart and become fluffy, rather than hold its shape. When you mash the soup, you want the potatoes to thicken the soup. If you already have waxy potatoes, like red potatoes, you can use them, and the soup will still be delicious. However, realize that your soup will likely have bigger chunks of potato and the broth will be thinner; it will not have quite the same texture as if you used a different kind of potato. 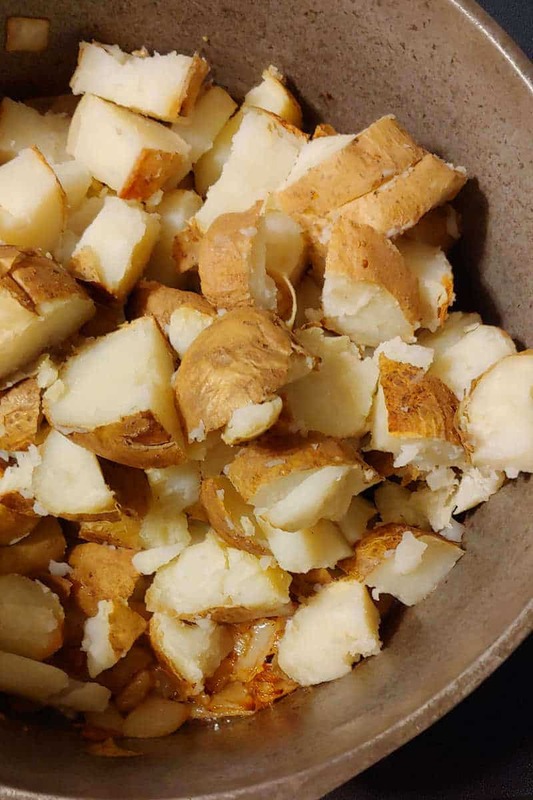 To learn more about the kinds of potatoes and their interchangeability, you can read this post from Kitchn or this explanation from Cook’s Illustrated. I really love this soup. I like the simplicity of the ingredient list – potatoes, bacon, onion, garlic, milk, and chicken broth, with a few seasonings. Things I probably already have around the house. It’s exactly how I want a potato soup. It has just the right amount of onion in it. 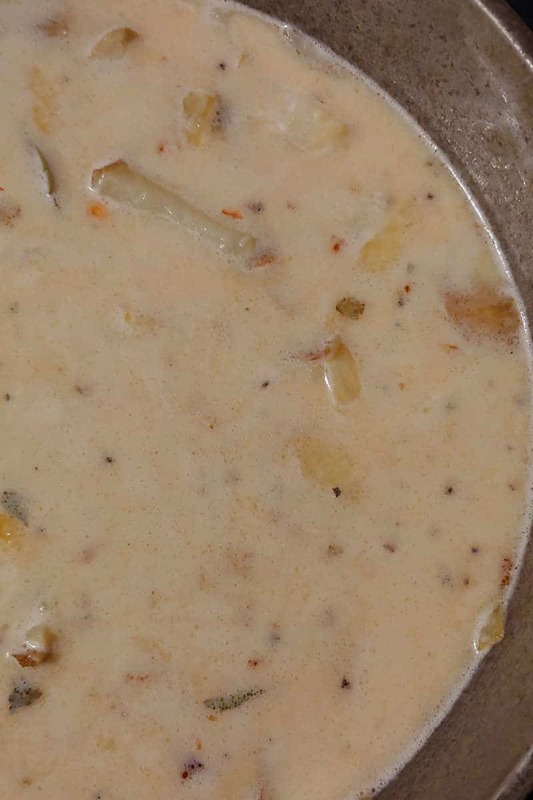 The potatoes thicken up the soup, making it creamy, but chunks of potato and skin give it texture. It has a great flavor without it being overwhelming. 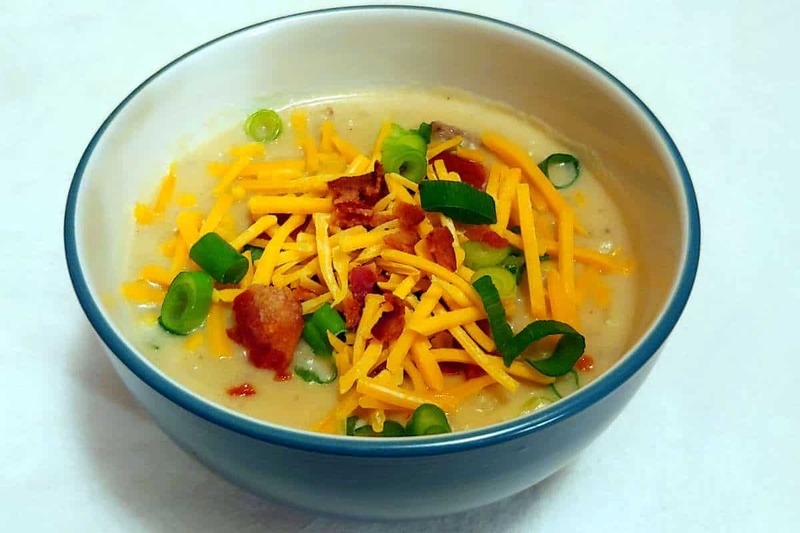 Top the soup with your favorite baked potato toppings when serving. Bacon that you’ve reserved from frying it earlier, cheese, green onions, a pat of butter, sour cream. Want to go crazy? I bet it would be delicious with leftover steak or shredded beef. I hope you like this soup as much as we do. Be sure to leave me a comment below if you try it! Want more soup? 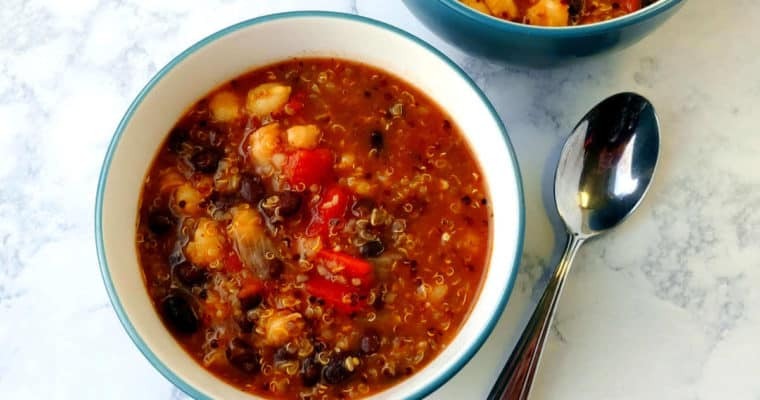 Try Slow Cooker Southwestern Bean and Barley Soup, Slow Cooker Chicken Enchilada Soup, Sweet Potato and Peanut Stew, Carrot Soup with Sesame and Chickpeas, Lentil Soup with Lemon, Black Bean Soup, or Slow-Cooker Chicken Chili. 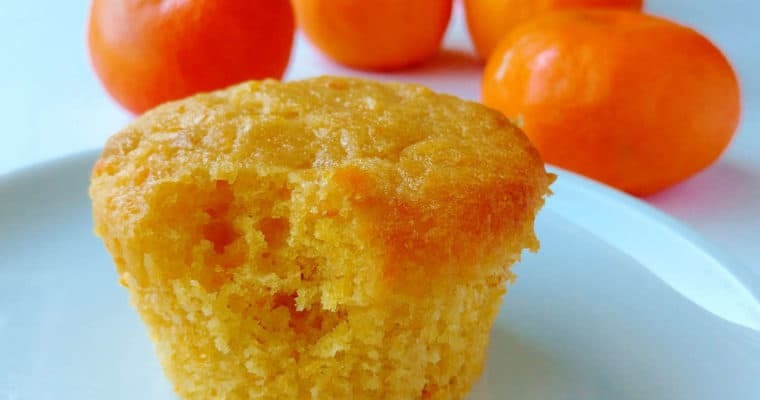 Like this recipe or have questions? Rate it or leave a question/comment below! 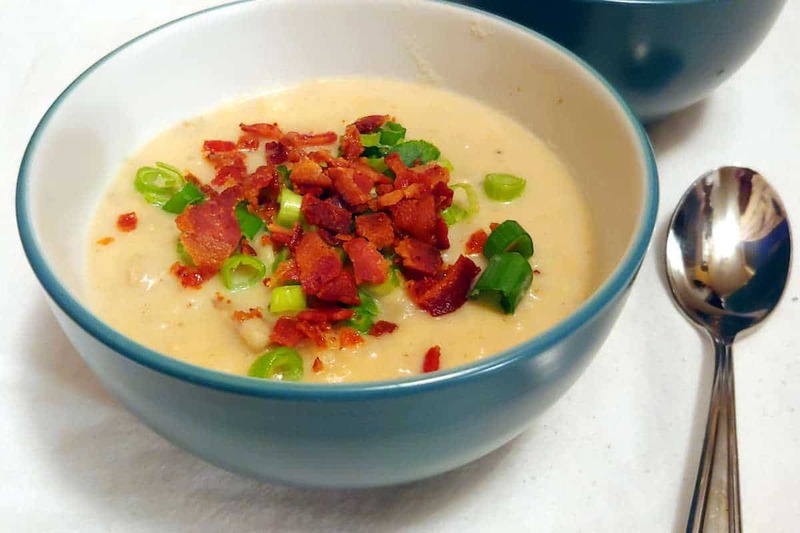 This baked potato and bacon soup is hearty, creamy, and delicious! A satisfying meal for cold winter days. Choose potatoes that are all around the same size. Scrub and pierce potatoes with a fork. Bake in a 400F oven for about an hour for 8-ounce potatoes. 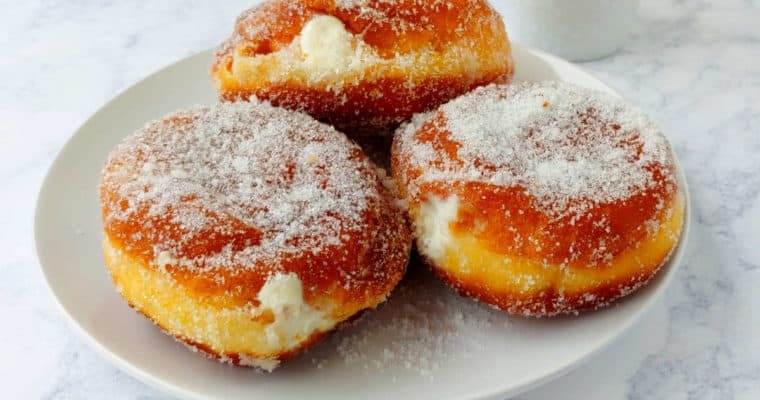 They're done once you can stick a fork in them without much resistance. If your potatoes are smaller (5-ounces each), they may take only 45 minutes; if they're big, they will take longer. If your potatoes are different sizes, use tongs to remove smaller done potatoes, and bake the larger ones longer. Once potatoes are cool enough to handle, cut in half lengthwise and slice. I leave the skins on because I like my soup chunky. 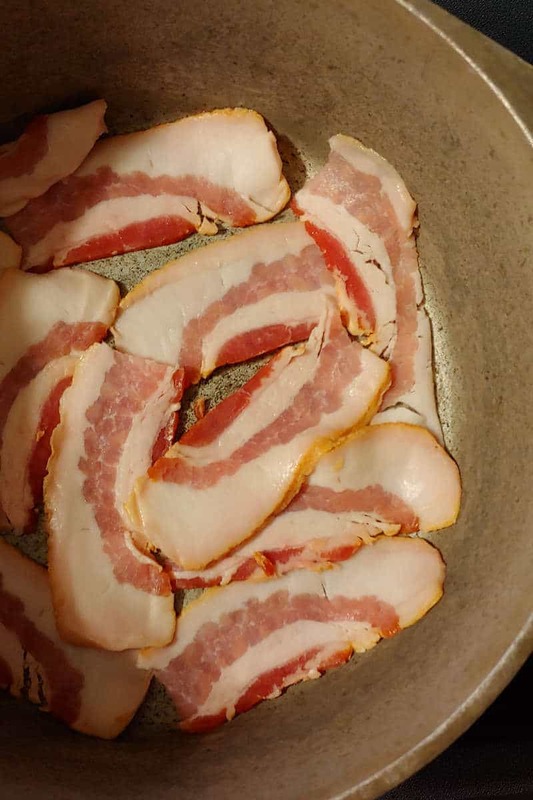 Fry bacon over medium heat in a large Dutch oven until crisped. (I prefer cutting my bacon in half to fit it all in.) Remove bacon and reserve for topping. Saute onion in bacon drippings for about 5 minutes. Add garlic and bay leaf and saute for a few minutes longer. Add chopped baked potatoes with skins, milk, chicken broth, salt, and pepper, and bring to a boil. Reduce heat and simmer for about 10 minutes. Turn off heat and mash potatoes with potato masher - mash a lot for thicker puree, and only a little for a thinner but chunkier soup. You can add extra milk if you would like the soup thinner as well. Top with reserved bacon and other toppings as desired. Leftovers are delicious. Store separately from toppings, and add the toppings after reheating the soup. 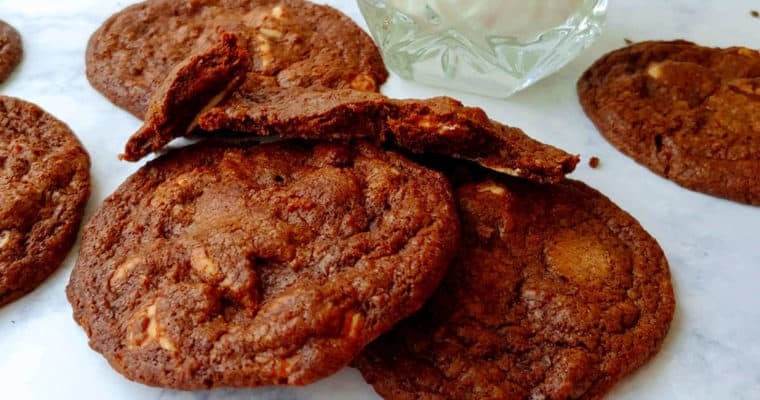 You can shave an hour off of this recipe if you have leftover baked potatoes in the fridge. You can also microwave the potatoes. Be sure to use baking potatoes (like Russets) or all-purpose potatoes (like Yukon Golds) here; they will release starch into the soup as they cook, helping thicken it. Red potatoes will hold their shape. To make this soup vegetarian, skip the bacon entirely and saute the onions in 4 tablespoons of butter.